Down in Brazil, the U.S. soccer team exceeded the expectations of soccer experts (and people like me who are definitely not experts) and oddsmakers and advanced out of the so called "Group of Death" in the World Cup and into a second round matchup with Belgium on Tuesday afternoon in Salvador. From now on, the World Cup is a knockout competition, so there is no more hoping that the results in another game go well to allow you to move on. Four more wins and the USA could claim the World Cup in soccer. The Americans likely won't do that, but the first two weeks in Brazil have shown us that this is one World Cup that is definitely not following the usual script. U.S. coach Jurgen Klinsmann, who has received criticism by the American press for saying that he doesn't think the team is good enough to win the championship this year, has at least given American fans the chance to believe that they can get a glimpse of the promised land of the Maracanã Stadium, site of the final on July 13. Next up for the USA is Belgium, one of Europe's stronger teams in World Cup qualifying, winning eight of ten matches with two draws, and one of three teams to win all three of its opening matches (along with Colombia and Argentina). However, the Belgians have not been overwhelming its opponents. Belgium has beaten Algeria 2-1, and then Russia and South Korea by 1-0 scores. Back in 1930, the U.S. win over Belgium received a five line AP summary in the LA Times sports section with the headline "Belgian Soccerites lose to Americans"
It's been hard to get a good read on just how good the U.S. team is after playing three games in different climates against teams with different talent levels and styles. The top American scoring threat, Jozy Altidore, left the first match early with a hamstring injury and may not play again. Captain Clint Dempsey has scored two goals and Jermaine Jones has also been a big contributor. The back line has been better than expected, although it still makes fans uneasy. The argument can be made that the U.S. team advanced because both Portugal and Ghana were not quite as good as expected. But, the margins between the good and bad teams in the World Cup are quite small, so a few breaks here and there, can make one team national heroes and another team, national goats. There has been far more buzz about this World Cup squad than other American teams, even the 1994 team that got to play at home. Part of this is that the team is better and the matches are a lot easier to see now because they are played at friendlier times (usually 9 am or 1 pm) and it's fairly easy to see them online. It has been a good time to be a fan of North American soccer, as both Mexico and Costa Rica have also moved on to the second round. Mexico will have its hands full with the Netherlands on Sunday morning at 9 am in Fortaleza. Costa Rica won a group that consisted of three past winners: Italy, England, and Uruguay. The Ticos will play Greece on Sunday at 1 pm in Recife. 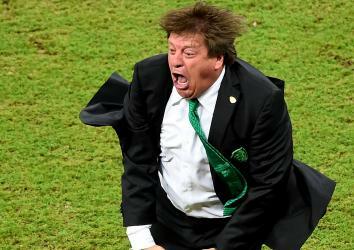 Mexico's team has been to fun to watch, mostly because of the passionate touch line celebrations of its coach, Miguel Herrera. The Mexican offense has been sluggish, but, goalie Memo Ochoa has been outstanding. The final 16 teams consist of five South American teams, three North American teams, two African teams, and six European teams. Four of those South American teams will play on Saturday: Brazil against Chile at 9 am in Belo Herizonte and Colombia will play Uruguay (who will be without suspended forward Luis Suarez after he bit a player during a match FOR THE THIRD TIME IN HIS CAREER. Just to be clear, he bit three different players, not the same guy three times. He also did it while playing for three different teams in three different countries.) That match will be in Rio de Janeiro at 1 pm. Brazil is still considered the favorite because of its homefield advantage, but the Brazilians do not look invincible. Colombia was very impressive in winning its three matches, although they were against a relatively weak group. A potential Brazil-Colombia quarterfinal matchup would be something to make time to see. It would also be played on July 4, so you don't have to worry about getting out of work. If the Americans were fortunate enough to get past Belgium, the likely opponent in the quarterfinals would be Argentina, who plays Switzerland on Tuesday. That matchup would be difficult, but it would be fun to watch because people get to see the wonder that is Leonel Messi. Messi, along with Brazil's Neymar and Germany's Thomas Müller, leads the tournament with four goals. The United States has made it out of the group stages now four times since World War II: 1994, 2002, 2010, and 2014. And in that time, the Americans have just one win, a 2-0 win over Mexico in 2002. Brazil eliminated the USA 1-0 in 1994, Germany won 1-0 in the quarterfinals in 2002, and Ghana won 2-1 in extra time in 2010 (it's not overtime. Don't call it overtime!) Early betting odds have Belgium as the favorite, although not by an overwhelming margin. It's hard for most American sports fans to accept the fact that an American team is being lauded for just being good enough to advance past the first round of a tournament. But that is a major accomplishment. The fact that the American soccer team is playing against heavyweights like Germany and Belgium and are taken seriously as an opponent and not just a bug on a windshield like they were in the past, is a major improvement. If media members like Bill Plaschke and Michael Wilbon, who know almost, but not quite entirely, nothing about soccer start noticing the sport is a big deal. And there are still soccer trolls like Dan Shaughnessy of the Boston Globe. The favorites the rest of the way appear to be Brazil, Germany, Argentina, and the Netherlands. The Americans may get their chance to play against more of those soccer powers on the sport's biggest stage soon. There is at least one more chance for people to get together like this. Or they could lose Tuesday. I'll still be watching in any regard.